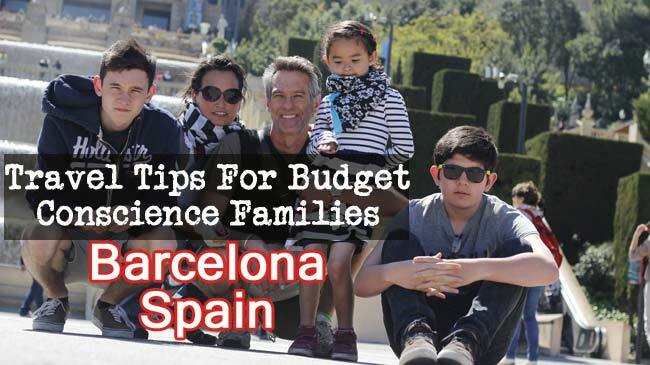 Whether you’re a British family looking for a Spanish Holiday or an American couple looking for tips to reduce stress on an inexpensive European vacation, below are some things we did that will help anyone who wants to visit Barcelona on a budget. What do you do when you live in France and your kids have 2 weeks off during the month of April for spring break? 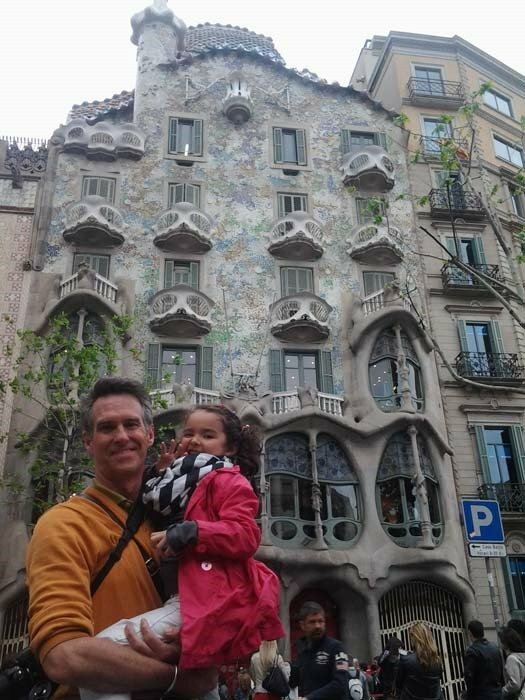 We decided to tackle one of our bucket list cities and visit Barcelona Spain. 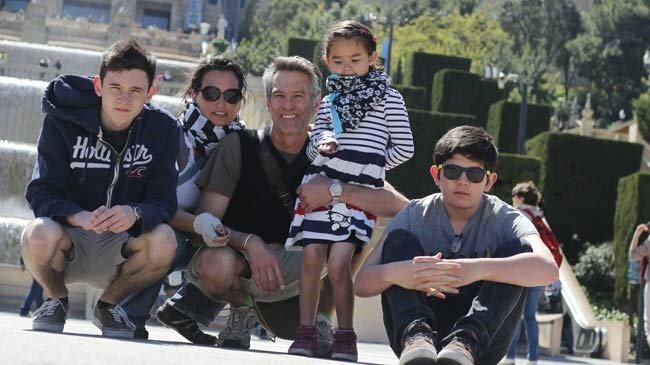 Not only was Barcelona better than I imagined, I was surprised at just how diverse, affordable and family friendly this city was for our budget conscious crew of five. It’s a no brainer. The most obvious way to save money on your trip to Spain is on transportation getting there. Will it be by plane, train, automobile or some combination of all three? 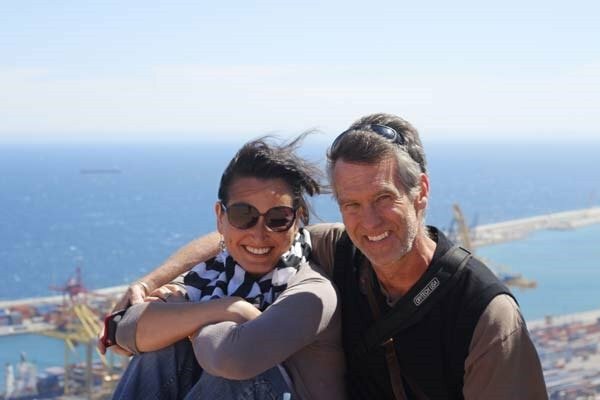 Since we live in France, just six hours from Barcelona and since we don’t own a car, we thought it would be fun AND INEXPENSIVE to take the train to Barcelona. WRONG! The train was the most expensive option. One round trip train ticket from La Garde France to Barcelona was over 400 euros. There are five of us so that meant that it would cost us over 2,000 euros for our family to get to Barcelona by train (over 2,500 dollars) which was waaaaaaaay out of our budget. We decided to rent a car for the week which cost us less than 400 euros. That 400 euros covered the cost of the car, the GPS, gas and car insurance. Not only was it more affordable to drive but we got to take in the scenery on the drive over. There are some amazing buildings and churches between France and Spain. The kids seemed to really enjoy the road trip too. They sat in the back seat listening to music, watching movies and watching the world go by. Ignore Kieran on the right, he gets a little car sick and he’s a moody teenager. If you do decide to drive to Spain or anywhere in Europe, take care to bring a credit card and or lots of cash and change for the toll booths. On our 6 hour drive, we encountered about 7 toll booths. A few were 2 or 3 euros but two of the toll booths were almost 16 euros. In total we paid about 75 Euros in toll booth fees. Obviously if you do not live near Spain or your only option is to fly to Spain, you won’t be able to drive. You can still find deals for flights especially during off peak season when prices can drop by half. There is an old saying, “there is no such thing as bad weather, just bad clothing”. If you decide to buy ticket during off peak season to take advantage of cheaper tickets, you should be prepared because tickets are cheaper for a reason. One of those reasons tickets are cheaper is because the weather is not always optimal for sightseeing but that’s ok because there are still plenty of things to see and do when it’s cold and rainy outside. For instance, during our trip to Barcelona, it rained 2 of the six days we were there. Rather than stay indoors and cower, we chose to throw on our rain jackets, buy some umbrellas and visit places that involved being indoors. We then saved the outdoor activities for the days when the forecast predicted sun. Another way you can economize is on food. 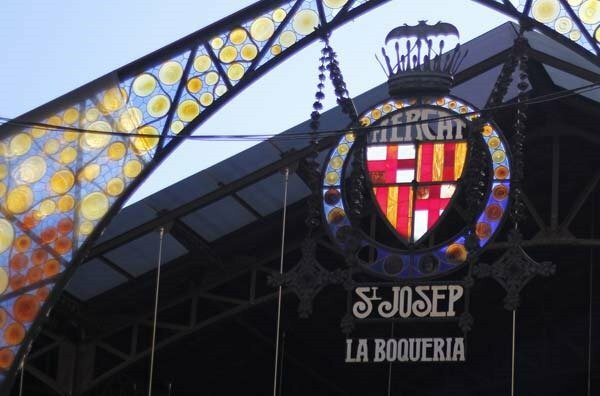 Rather than tell you about all the great tasting and inexpensive tapas we had, I am going to tell you to go check out one of the outdoor markets called Mercat de Sant Josep La Boqueria, (open Monday through Saturday) located right off La Rambla. 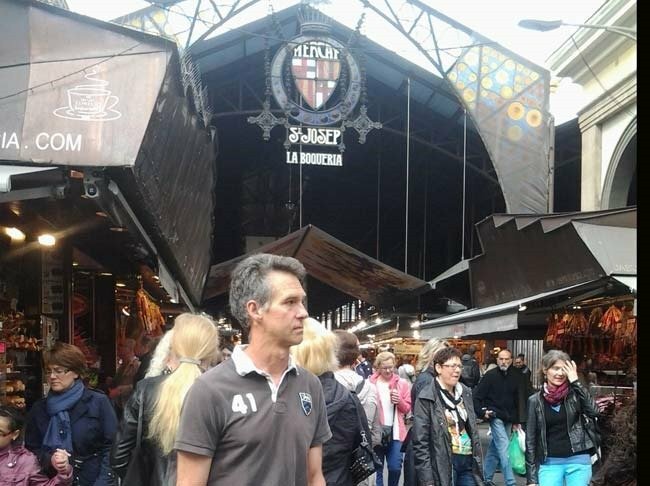 La Rambla is one of the most popular areas to walk around to shop, eat and take in the sites. Every guide book will tell you to visit it.. 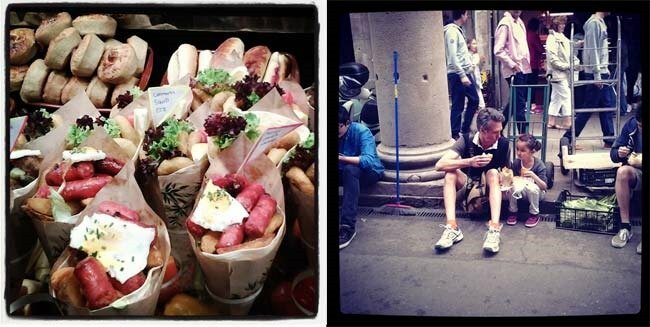 The St Josep market is literally a cornucopia of things to see, eat and smell. There were also many restaurant vendors selling the most magnificent foods at the open market. From fried octopus and traditional tapas to nachos and chips. 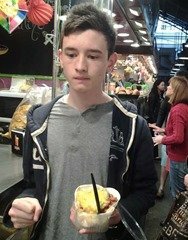 We ended up eating at the market several times. The kids all loved it because they each found things they wanted to eat. Blake and I loved it because it was DELICIOUS AND CHEAP. We also bought some fresh fruit and things we can’t find in France like refried beans and hot sauces. The French don’t really like spicy food and I do. How do you tell someone to cut your hair if you can’t communicate? One of the things we did were ordinary things we might do at home but because we were doing them someplace new in a language we did not speak, it added a whole new dimension to an otherwise ordinary situation. It was not only cheap, less then 10 euros but also an adventure. Neither of us speak Spanish so we were wildly flapping around our arms and mimicking scissors with our hands to try to tell the barber how short to cut Blake’s hair. Fun times! Blake ended up with a crew cut and the shortest haircut of his life. I loved it, he not so much. First visit to Burger King… BLEH!!! It’s been over 8 years since our family has eaten a meal from any fast-food restaurants like McDonalds and Burger King. That means that our almost 6 year old daughter had never ever eaten at a McDonald’s or Burger King her entire life, aside from an occasional coke here and there for emergency pit stops. That all ended when we visited Barcelona. Catherine was dying to try fast food but we could never justify taking her there until we were in Barcelona. Everyone needed to take a bathroom break so we stopped at a Burger King to kill two birds with one stone. 1) Satisfy Catherine’s need to eat fast-food and 2) let everyone relieve themselves in the bathrooms. Catherine got some kind of chicken nugget balls ( I hope they were chicken) which she was excited about at first but then quickly became disenchanted with the taste of the chicken ball things. She did however love the paper crown hat which she forced us to take home. We all just sat around and watched her enjoy her moment. 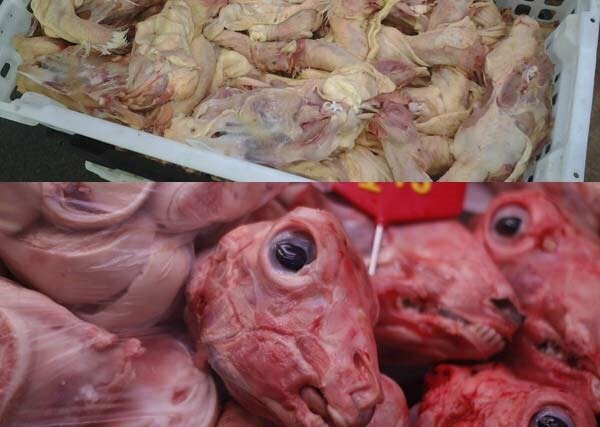 I think we’ll continue our tradition of no fast food and save it for trips abroad. We also did a lot of random exploring. There was a huge cat sculpture which was just begging to be climbed. 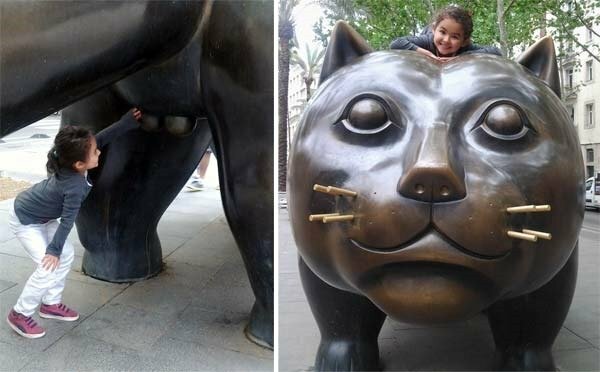 Catherine enjoyed climbing the monstrous metal cat thing but was equally quizzical about the two balls hanging from the cats posterior. Needless to say, we handled the situation very delicately; no pun intended. 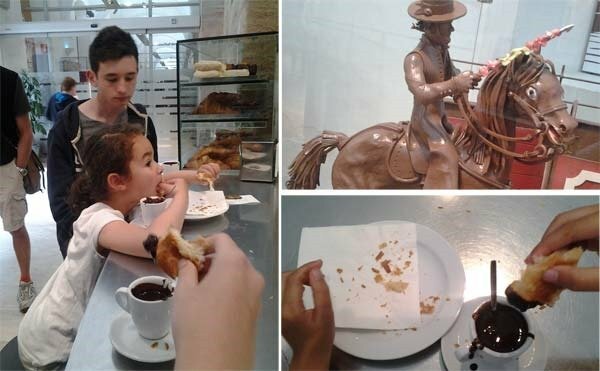 One spontaneous and inexpensive things we ended up doing was visiting a chocolate museum called “museu de la xocalato”. It was totally unplanned. We were walking around near the Picasso museum and just happened upon it by accident. It was a rather smallish museum but it was cheap. Less than 6 euros per ticket but instead of a ticket you got a bar of chocolate as your entrance ticket which you get to eat in the museum. That’s what Catherine is holding in the photo above. Not only were there tons of information on how chocolate was discovered and hundreds of chocolate statues but there was a cool chocolate bar that served melted chocolate in a cup which we ate by dunking croissants into. It was to die for. I had never done this before, but I read that Barcelona was a place where you walk a lot. Having three kids, who have travelled a lot, I knew that one of their biggest complaints and most stressful things for me was going places where there was a lot of walking. Not only did we cover more ground but the kids really enjoyed having scooters to jet around in some beautiful places. I am definitely going to bring them for our next excursion. What do you think? Did they enjoy themselves? Andre was doing tricks and so was Catherine. 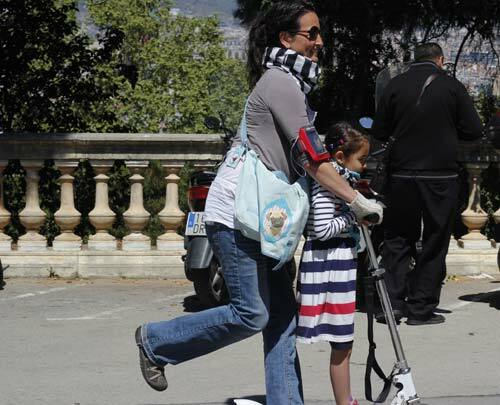 One of my son’s rode his scooter down a hill while I took the funicular down the mountain with Catherine. Everyplace with wide open spaces suddenly became a new place to explore on scooters rather than more walking in the hot heat. I made sure to get a big enough scooter that Catherine and I could share because when she got tired, I just scoot along with her. Meanwhile… Blake and I were actually having a good time relaxing while the kids scooted around. There is nothing worse than kids on vacation who are whining about walking. 7- Go see some of Gaudis Greatest Works. Gaudi was a Spanish architect born in Catalonia whose work was inspired by religion and nature. His works are more like art then architecture. We went to see CASA BATLLO, this smallest of Gaudi’s famous works which has a dragon and sword on the roof and an interesting front facing façade. You can take a tour of the house which we did and I highly recommend you get the audio tour and get your tickets online since the line to get in can get really long. 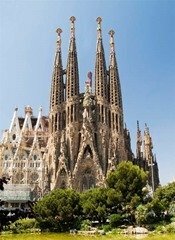 Another one of Gaudi’s work is the Sagrada Familia Church. It is possibly one of the most unique and fascinating churches I have ever laid eyes on. This gothic beauty looks like it could have been made with sand and melted wax to me. Pictures just don’t do it justice. There are other Guadi works but I will let you do the research on that yourself. If you want to visit Erope on a budget or with kids, I highly recommend Barcelona. It literally has something for everyone on every budget. We plan on going again because one week was just not enough. Question: Have you been to Barcelona? What did you think of it? If not is it on your bucket list of places to go?